So, you’re ready to become either an EDGE Expert or EDGE Auditor, but you need help figuring out your next steps. Don’t worry, we’re here to help! No matter which role is the best fit for you, you’ll need to attend training and pass the EDGE Exam. The EDGE Technical Workshop helps participants understand the EDGE standard, use the software application and navigate the certification process. The course also prepares EDGE Expert and EDGE Auditor candidates to pass the EDGE Exam. Register today for our new online version of the course or see when the course available live in-person next. The EDGE software is free to use at edgebuildings.com. Within minutes, you can determine the most cost-effective efficiency measures for a green building. Based on a building’s parameters, the EDGE software discovers energy and water-saving design opportunities through region-specific and use-based analysis. 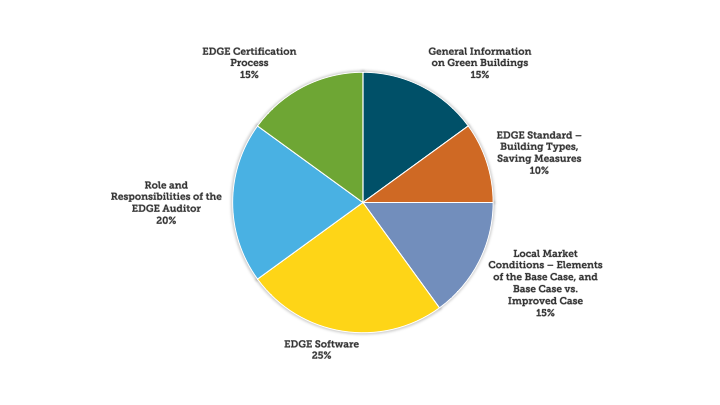 As a free design tool, the EDGE software presents predicted cost, savings and payback periods for a menu of green building measures. Be sure to use the EDGE software while studying. You’ll want to create hypothetical projects in the software and see how the results change when you choose different options. Make sure to create different building scenarios, so you can comprehend the results each measure gives you. You can click on any efficiency measure within the EDGE software for a quick explanation, or obtain more information and a deeper explanation by connecting to one of the building-specific EDGE User Guides. Be sure to review the EDGE User Guides in depth, as well as the Methodology Report. To pass the exam, you will need to know the ins and outs of what the EDGE Auditor does as part of the certification process. You’ll need a grasp of which efficiency measures are appropriate for desk (documentation) audit versus site audit, as well as when and how often to audit each measure. In addition, you must be able to recognize and avoid conflicts of interest between an EDGE Auditor and a consultant. You will also need to understand the relationships and responsibilities among the parties involved in the certification process: EDGE Auditor, clients, project teams, the local and global certification providers and IFC. Finally, you’ll need to know the various responsibilities of the auditor: ethics, contracts, renewing/maintain EDGE Auditor status and pricing. Be sure to carefully study IFC’s EDGE Expert and Auditor Protocols, Certification Protocol and Glossary. The EDGE Exam is administered by Prometric (a third-party testing center) and currently costs $100 USD. A complete list of test center locations may be found at prometric.com/edge by clicking on the “Locate a Test Center” link. You may also take the EDGE Exam from the comfort of your home or office as long as your workspace and computer meet the requirements specified in the Remotely Proctored Candidate Information Bulletin. The exam is administered via computer and consists of 75 multiple-choice questions, with a 2.5-hour limit. All exams are closed-book. The exam is currently available in English, Chinese, Spanish, Vietnamese and Indonesian Bahasa.